Publisher’s note: Purity Audio Design and PAD (Purist Audio Design) are not affilated to each other. The cover of Sports Illustrated featured Robert Griffin III as the forerunner in the NFL draft. They say he is a phenom; supposedly he tosses 70-yard passes by a flip of the wrist! The expectation is that he is the next big thing in quarterbacking. Wouldn’t you love to have been the talent scout who spied Griffin and predicted his future as a highly touted draft pick? I’m no NFL talent scout, but I am a high-end audio component talent scout of sorts, and I have a name for you. 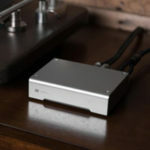 It’s Purity Audio Design, and the particular model I’m discussing is a handmade preamplifier called the Silver Statement. It can be operated passively, or actively by the isolated power supply which resides under the line stage. It’s wonderfully alternative in its appearance, as the line stage’s chassis comprises an opaque sheet of about 1/2” acrylic heat treated to allow bending upward of the sides to form a tub filled with electronics – an electronic tub. The bottom half of the face of the line stage’s chassis is similarly opaque, but the top half is smoked clear acrylic, allowing a glimpse of the innards. The power supply for active use of the preamp is housed in a similar but slightly smaller inverted acrylic housing. The symmetry of the pair call to mind the odd shapes associated with Geometry exercises or modernistic drinking glasses. The inside of this transformer-coupled preamp is worth seeing, with a second autoformer not accessible from the front panel or the remote. The autoformer has 6 positions in 3dB increments and influences the volume control of the unit. The autoformer can be changed “on the fly” when music is being played. 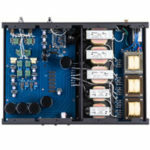 Per Purity, its purpose is to lend flexibility such that the preamp can be mated optimally to any power amp, in either the passive or active modes. I spent some time using the Silver Statement in passive mode, and found that while it was noticeably cleaner it did not capture the dynamic fortitude of the unit in active mode. I determined that I preferred the active mode and could improve the overall system clarity by rolling discrete Opamps in the Eastern Electric Minimax DAC Plus, which I used predominantly with the Silver Statement. I assure our readers who consider themselves purists, that use of the passive mode rewards handsomely nonetheless. In passive mode, it becomes an extreme line stage with no grunge being added to the signal. The internal autoformer was of utmost importance with the passive mode, and I found I had to bring up the output to maximum to have a wide range of operation with the remote control. It should be noted, however, that the efficiency of the speakers used will determine to what extent the output of the autoformer must be increased. With the King Sound King ESL, which is inefficient as are most ESL speakers, I still had to increase the level greatly even though the autoformer was topped out. 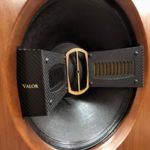 But using the preamp in passive mode, I found no great barrier to satisfactory listening levels, at about 80-88dB range, with dynamic speakers like the Daedalus Ulysses in for review. Though I do not discuss further here the experiences of using the Silver Statement with the Daedalus speakers, be assured that they were similarly sensational as with the King ESL. When I played playground basketball, regularly there was a guy named Jim who always brought his smooth, plastic-feeling ball. All of the rough surface for obtaining a grip when shooting had been worn off, and when shooting I found it slippery upon release. I derisively called it the Plastic Fantastic, but Jim could shoot it with marvelous accuracy. Most manufacturers of fine audio gear seem to look with similar contempt upon using anything other than thick metal chasses for components. Not so Purity Audio Design, which sees its acrylic housing as no impediment to obtaining excellence. 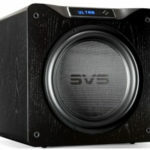 The exceptional sound quality of the Silver Statement instantly dispenses with the industry-wide claim that a massive metal chassis is a necessity to achieving superior sound. The Silver Statement isn’t close to the brick-like, stolid appearance and feel of many preamps. It is not quite brittle, but it is delicate. Thankfully, it is shipped in a hardboard-reinforced double box so that it will not suffer the deleterious effects of shipping. The plastic threaded footers and light acrylic lid call for careful handling; if you were to drop it, the housing would likely shatter or at the least crack clean through. On the other hand, it weighs about 1/3 of a preamp housed in a heavy metal case. If you thought that plastic boxes with electronics couldn’t sound good, you would be converted after hearing the Silver Statement! Its performance flies in the face of convention, and fairly shouts, “It’s the circuitry, stupid!” Hearing a device like the Silver Statement convinces me that the efficacy of a component lies perhaps less than 1% in the housing and more than 99% in the circuitry. The POWER button, the only feature on the power supply’s face, sits centrally located on the bottom unit, while the top unit is a study in ambiguous LEDs. I am not crazy about the controls and indicators on the face of the Silver Statement. At the left are the DISPLAY and MUTE buttons with corresponding LEDs. In the middle are twin Left and Right digital readouts with the volume control in between befitting a Dual Mono design with balance control; nothing out of place with that. It is the right side controls which could use improvement. Intermittent buttons and LEDs for functions 1 through 6 for the INPUTS caused me to regularly refer to my notes to see which input was selected and if it was in phase or out of phase. For the longest time, I thought that input 4 had a burned out blue LED when, in fact, I had inadvertently depressed the phase button and it was operating in inverted phase. These buttons should be reworked to remove confusion about their operation. The rear of the unit is tidy, with Inputs 1-3 XLR and 4-6 RCA, all on the left side of the unit. On the right are outputs 1-2 XLR and 3-4 RCA. A thinner silver plated copper umbilical connects the two chasses. In discussing the power supply Joe Jurzek, one half of the Purity Audio Design team along with chief designer Bill Baker, admitted that the Remote Power On/Off switch is redundant and will be eliminated going forward. When the unit is plugged in, the line stage remains powered up even when the power supply is turned off. The tubes are used supposedly at an extremely low voltage and will last several years. The inside of the unit – I looked into the linestage main-chassis only – struck me less as an electronic device and more like a commissioned piece of modern art. In place of the typical PVC circuit board was a sheet of copper, upon which sat in the foreground a pair of Westinghouse 12AU7 tubes running at 3mV, and behind them giant “Purity Caps.” It is one of the few minimalist design efforts I have seen which also has elegance. One sees, and hears, instantly that parts quality and minimum interference with the signal is the methodology of Purity. A glance at the Purity website shows a product replete with top quality internal components: silver Bybee Purifiers, silver Teflon wiring throughout the signal path, Teflon tube sockets, silver plated power supply, and all-autoformer level control. As for the Bybee Purifiers, I had never used them prior independently or in any device, but this component convinces me that they are capable of being integrated into an outstanding design. There are some serious goodies packed into this tub-O-sound! Here, however, is where the tub analogy breaks down completely; this is not a tubby preamp, it’s a stealth warship! I have laid hands on no preamplifier regardless of price which is capable of such a pure sound. There is no electronic overburden, no perceived dynamic lagging, no smearing or smudging of the signal, no colorizing or polarizing (as with sunglasses) standing in the way of the music; the Silver Statement is clean and clear, and clearly top quality sounding. When I reviewed the Clarity Cables I concluded they were aptly named, as they sound clear. Similarly, I conclude that the brand name of the silver statement, Purity Audio Design, is more than a come on, for it does sound tremendously pure.